The days of the ‘economy vs. environment’ fight are over, and really have been for several years. How do I know this? Because the World Economic Forum in Davos, Switzerland tells me so. 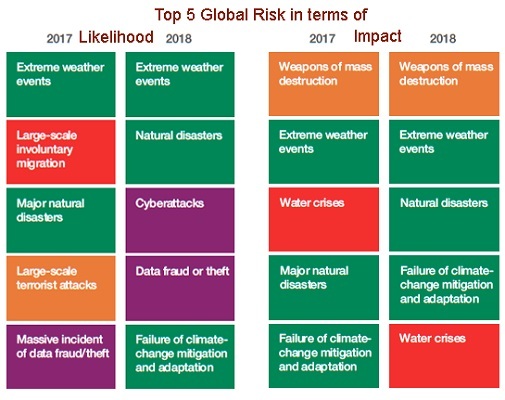 Since 2011 environmental factors have been in the top 5 global risks in both likelihood and impact. This year, environmental factors dominate both categories. This is the change of consciousness that those of us at This Space Earth have been striving for – there is only one Earth and we are all on it together. For humanity to have a future that it wants, we need to think and act in terms of systems, not silos, while operating in the context, capacity and constraints of the planet. And while those statements may seem obvious, our planetary footprint of 1.7 earths (2), the increase of greenhouse gases in the atmosphere, extreme weather events, ocean acidification, air pollution, water pollution, and the extinction of 150 species per day (3) clearly indicates that collectively we are not behaving in a way that understands and acknowledges the realities of the only known planet in the universe on which we can exist. There is hope and optimism for the future, provided we start thinking and acting in a planetary context. Given the lag time between cause and effect at a global scale, in the next 20-30 years we are going to experience pain from the events we unknowingly and unwittingly initiated decades past. As to the actions we collectively take going forth, it will be our children and grandchildren who will really reap the benefits. But that’s OK. Isn’t that what we are supposed to do – set up the next generation so it can have a better quality of life than previous generations? Unfortunately the great unknown is, will we? ‘Can do’ and ‘will do’ are different things. Will those who are ‘comfortably unaware’ be willing to acknowledge their differentiated responsibility to the health and viability of our planet’s future? I don’t know. What I am sure of, is that humanity’s future will be a shared one. The future is our fate – the future is ours to make.